Welcome to the Earth Day Green Giveaway Hop! We are giving away a 128-load bag of Molly's Suds Laundry Powder PLUS a bottle of Molly's Suds All Sport Wash! Enter to win using the Rafflecopter form below, then hop to the other blogs to win more earth-friendly supplies and gear! Thanks so much for entering! You will love Molly's Suds just as much as we do--my cloth diapers have no build-up, even with our hard water. I've been using it on our regular laundry as well and it gets my clothes clean! It's natural, vegan, and safe for those with allergies to normal detergents. Thanks, Molly's Suds, for making a detergent that's good for my family and good for the earth! 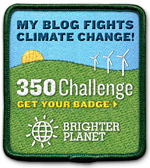 Check out the other earth-friendly giveaways at these blogs!